Check us out at our new location!!! So, for the last, oh, 5 years or so, I have been serving soup with either drop biscuits or no-knead 5 minute artisan bread, which if you haven’t tried yet, you absolutely should because it is so, so, so, so easy and so, so, so, so, so, so, so, so, good! Is that enough so’s for ya? Seriously, this bread is like the one thing I miss most about being gluten-free. Well..besides breaded/fried mozzarella cheese sticks that is– the ONE food I totally craved in my last two pregnancies. I can’t even tell you how excited I was last summer when I discovered that a local grocery store in Rhode Island carried GLUTEN-FREE fried mozzarella sticks! Those were no doubt responsible for at least a couple pounds of extra baby weight I am currently trying to lose. Thankfully, I haven’t found them in a store down here in Naples yet, otherwise I probably would have gained like double that weight. Anyway, back to the popovers, so I’ve always served soup with either biscuits or bread, because that is what my mother did..and well you know, we do things a certain way because our mother did them. Except my biscuits never, ever came out the way I remembered my mother making them. Never, ever, ever, ever. And today..I FINALLY figured out why…because my mother wasn’t serving biscuits all those years…she was serving POPOVERS. Awhile back, I noticed a recipe for gluten-free popovers on the back of a box of King Author gluten-free flour blend. And, I said to myself, Self, those popovers sound good, you need to try them. So, today I did..except I had long used up that box of flour, so I hopped onto my trusty laptop and used good ole’ google to find another recipe for gluten-free popovers. So, I made them tonight for dinner, took one bite and was instantly transported back to my childhood. I remember sitting around my kitchen table on long wooden benches and eating green onion soup (yuck….no offense mom..but I hated it) begrudgingly just so I could eat those delicious little balls of crusty goodness on the outside and delicious airiness on the inside. I can even distinctly picture the bright yellow bread basket, covered with a towel, she used to serve them in. And all this time, I thought they were biscuits!! I’m so embarrassed. Anyway, these gluten-free popovers are DELICIOUS! Greta even said they were “super, incredibly, amazingly yummy” and for her to say that about a recipe that doesn’t even contain any sugar is pretty darn amazing! And they are SO easy! I will never, ever, make biscuits with soup again.. 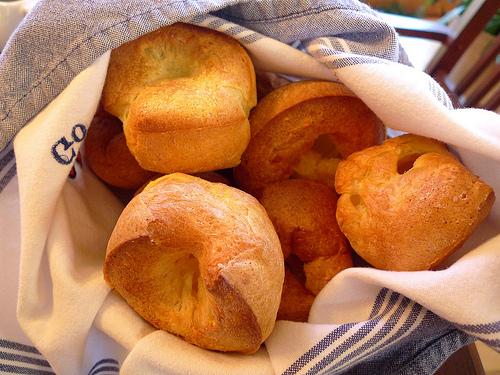 I am forever converted to a popover fan. Anyway, dear readers…here is my wonderful recipe for gluten-free popovers that taste JUST like how I remember my mom’s regular old, gluten-containing popovers tasting. 1 1/2 tsp xanthum gum (omit if you are using a flour blend ..like Namaste, which already contains xanthum gum). Preheat oven to 400 degrees. Whisk all ingredients together until smooth. Grease 18 muffin tins and fill each tin about 1/2 way with batter. Bake in preheated oven for 15 minutes. Prick each top with a fork to let steam escape and then bake 5 minute more. Remove from oven and ENJOY, ENJOY, ENJOY! So, I was reading through some old, old, old posts of my mine on this blog, and came across one entitled Birth, which surprisingly enough is all about birth. This post was written about 6 weeks or so after John’s birth…but back then I was all paranoid about the internet and didn’t use my kid’s real names and tried to be all secretive and anonymous and stuff, so I called him “Baby Son.” Now..I’m just all “eh..whatever” and figure that as long as I’m not posting anything I wouldn’t want my mother or my neighbor to read then it’s all good. Anyway…back to the topic at hand. So, I was reading that old post, and it made John’s birth seem so dramatic and scary. And, I suppose it was. John was born at a hospital, under the care of a CNM (that’s certified nurse midwife for those of you not familiar with that particular bit of nomenclature). My labor with him was pretty stop and go and *I* ended up asking for my water to be artificially broken to speed things up…and speed things up it did. But, after that, fetal-John started to go into “distress” and there was some heart decelerations and I had to get him out NOW and it was a lot of hard pushing and stress and pain. It was not an experience I wish to repeat again..although he was (and still is) pretty darn cute, so it was all worth it in the end. Heidi and Greta had pretty typical hospital births with almost textbook labors..both using regular OBs and nothing scary or exciting happened. And, while labor certainly wasn’t fun and there was a good bit of pain involved (especially towards the end), overall they were pretty ho-hum…just your typical, textbook, hospital, labor and birth (except without the epidural..which I guess most people typically do get). Elsa’s birth on the other hand was totally and completely different from all my other births. The other ones, generally all followed the typical pattern of easy contractions, go to hospital, labor stops, walk around to get labor started again, labor starts again, progressively more painful and closer contractions, exceedingly painful-cut-me-open-NOW transition contractions, to pushing, to baby’s born..hooray! Elsa’s labor and birth was almost like a non-event. In some ways it feels like I didn’t even go through labor and birth at all, she just sorta fell out of me and..oh look..here she is. With Elsa, for a variety of reasons, we decided to go with a homebirth. It was something I had put a lot of thought and prayer into..even reading a lot from anti-homebirth blogs and sites. There were several reasons we chose homebirth, but the main one being that in the past, as soon as I get to the hospital, my labor always stops. This is super, super, super annoying because we had gone to the hospital to have a baby and just wanted to get on with the business of having the baby. Anyway, because I was planning a homebirth with Elsa, I wasn’t paying too much attention to contractions and basically just went about my regular, ordinary day doing all the regular, ordinary things I would be doing on that day. As typical of any homeschooling mom, this involved lots of walking around and being on my feet..which I think definitely helped labor along. Anyway, along towards evening, after cooking dinner and washing the dishes, the contractions started to get un-ignorable, but still pretty far apart and we decided to call the midwife. She arrived and contractions were pretty intense, but still like 10-15 minutes apart and very manageable as long as I was walking around. We thought we had HOURS and HOURS left. Then boom, while in the bathroom…all of a sudden I had like 8 strong contractions which were about 30 seconds apart. I started to feel nauseous (as I always do during transition), I started to feel pushy and somehow managed to walk out of the bathroom and call to the midwife and Ben to get there. I was going to ask the midwife to check me, since I thought I was pretty far along, but didn’t think I was fully dilated. However, just as they walked into the room, my water broke..I started pushing and baby was born like 2 pushes later. The whole “intense” part of labor and birth probably lasted no more than 20 minutes (while with my other labors it was 2-3 hours). I’m not kidding when I say that it totally felt like a non-event and it was EASY. Almost, like one minute things were just pretty ordinary and the next minute, I had a baby. After she was born, all I could say over and over again was that I couldn’t believe how fast that was and that it was already over. Now, don’t get me wrong…I’m SUPER thankful that I was BLESSED with such and easy and quick birth..but in some ways it feels weird. Like, I didn’t work hard enough or get exhausted enough. Labor and birth is supposed to be this great, big EVENT, but between NOT going to the hospital and having such a quick birth..it almost felt like a non-event. It’s wasn’t this super challenging mountain to climb and conquer, it was more like this little walk in the park with this tiny little hill at the end. But, as with all my births, no matter where or how they were born, we ended up with a beautiful, healthy babe…and that is after all the most important thing. And now, I have nothing more to say, so I’ll just leave you with this cute little picture of Elsa when she is just a few hours old! Notice her ear. When I first saw her, all I could think was “OMG, she has pointy, elfin ears. Everyone’s going to think she’s a freak. Aaaaaaaah” Then I calmed down and was all “Oh, she’s so cute…look at those little pixie ears, she’ll have a fun, distinguishing characteristic.”. But, alas..her ears have since rounded out to just regular, old, ordinary looking ears…so I guess she’s not really a pixie after all. 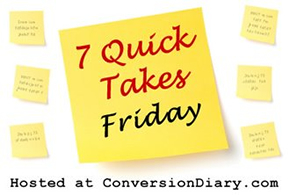 So, like all the cool Catholic bloggers are doing this whole 7 Quick Takes Friday thing..so I figured I would try it. Surely…even I could think of 7 quick things to post about. And, obviously posting about 7 Quick Takes counts as my first Quick Take..right? Yesterday was one of THOSE days. You know those days…the type of day where any homeschooling mom starts thinking that boarding school sounds really, really good. Greta just about did me in with learning multiple number 3-digit addition with estimation to boot. I didn’t like all those long math problems as a kid…and I hate them even more as a parent. Then I came to my senses and realized that even if she went to school, I’d still have to help her with her homework and I’d still be banging my head against the wall..so it’s all good. How come no one ever told me before I had kids that I’d have to deal with things like super long, annoying math problems AGAIN? Believe it or not, I actually used to be on the math team in high school…so I’m not teaching my girls something wimpy like “Math Class is Tough” (anyone else remember that Barbie controversy from like 20 years ago? )…but I hated all those long problems back then, and I still hate them now..can’t wait until we get to fun stuff..like calculus. 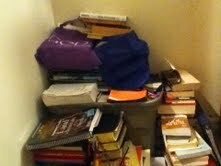 We used to have this one, rickety, falling apart bookshelf. It was one of those cheap, particle board things that someone I put together incorrectly. Yesterday, we had to look behind it for the missing Kindle Fire charger thing which somehow got kicked behind there. Super Mommy found it..but when I moved it, it started falling apart and we ended up taking all the books off and throwing the bookshelf away. Now the corner of our living room looks like this and we have to find a way to store these for the next 5 months (or 8 months) until we move. Otherwise, it will almost definitely guarantee that Elsa will start crawling and pulling up before then, because what baby can resist wreaking havoc on a stack of books like that? Speaking of Elsa..last night she did something almost UNHEARD of in this house. Are you ready for it??? She fell asleep WITHOUT NURSING!! I know, I know…I almost passed out from shock too. Last night, I was busy cutting out little sheep shapes for our coop project today and she was lying on the bed, in the dark, sucking her hands and I go in there and the next thing I know..she is ASLEEP…ALL ON HER OWN!! Woo hoo! Of course, then she woke up an hour later and refused to settle without me next to her…but it was nice while it lasted. I’m reading a really good book right now. 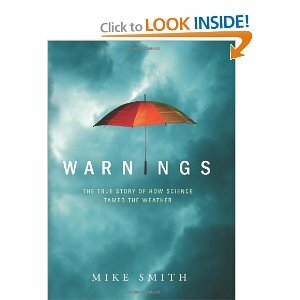 It was a Christmas present (the kindle edition) and I’m really enjoying it..and it’s kinda making me want to move to Tornado Alley so I can be one of those Tornado Chasers (ok..not really…Tornadoes scare the heck out of me..I’d much rather deal with hurricanes.) But, it is fascinating..especially to a science geek like me. Elsa is FOUR MONTHS OLD TODAY!! Can you believe it? I can’t believe it either..time is just flying by! Check out this cute little bundle of chubbyliciousness! 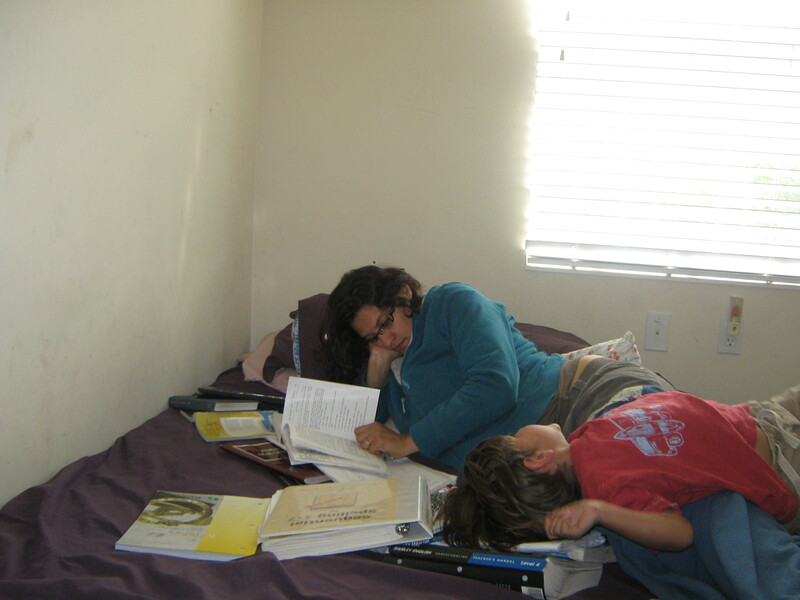 After a lovely 9 whole days off from “school” we started our homeschool work back up again this Wednesday. Wednesday is piano lesson day, which means we need to finish all our work before 1:40 PM or so, so I can take the older girls to piano. For many homeschoolers…this is a piece of cake. But…not…for us. We typically get a later start to the day….which means we don’t finish our actual “work” until a bit later. Homeschooling feels like this huge balancing act to me…like if I lose my balance for just one second we all fall off and land face first in the ground. 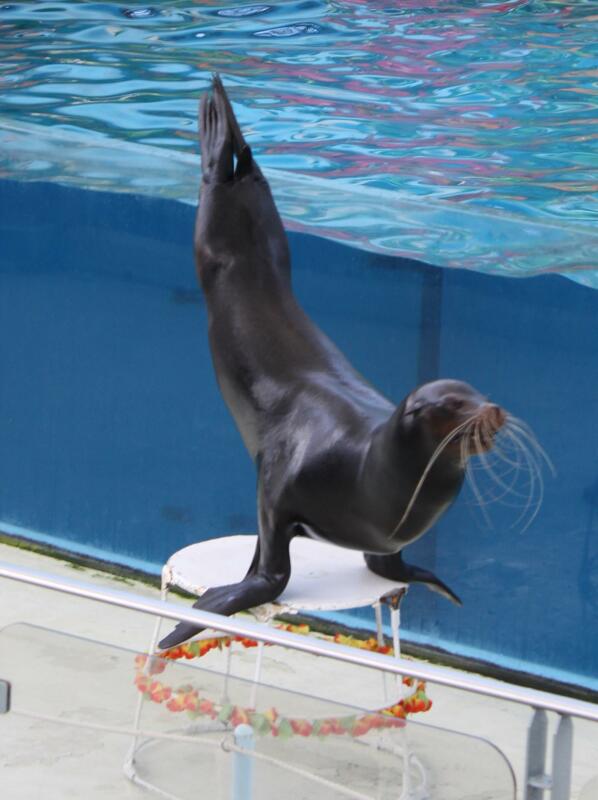 Kinda like how this seal feels…I’m sure. John is the only one who wants to do school…and the only one not legally required to be in school (ironic..no?). So, as soon as I announce “It’s schooltime” with a big cheerful, happy smile on my face he pesters me to do his “sublects” and while I’m trying to help him, I’m also trying to get Heidi and Greta (who are considerably less enthusiastic) started on their work. They each pick a subject and start working independently…for about 3 minutes. Then, the inevitable happens. Someone calls out “I NEED HELP” and if I don’t help that child THAT.VERY.SECOND she wanders off to parts unknown. Funny how a house that seems SO SMALL most of the time, can seem SO HUGE when a child wants to make herself scarce. Meanwhile, while I’m helping Child A, Child B has finished her assigned work in that subject and had decided to wander off for unknown parts. So, then I find Child B and help her and keep her on task..meanwhile Child A finished something and decides to wander off before I can assign her next subject. I find Child A and get her started on something and while I’m teaching or helping Child A, Child B finishes and wanders off, so I get Child B started and then Child A finishes and wanders off. And, the above scenario repeats..well…repeatedly (duh) until we finish (or um..don’t finish) our work. Yep..this is how we do school in our house! I have no idea what John is doing in this picture…but since this was taken last March and he’s still running around, we figure he must be okay. Now, I realize I shouldn’t get too mad about this “wandering off” business…they totally get it from me. I was raised in a family where we were modeled that time is never to be wasted..not even a second. I can remember us all waiting for my mother to go someplace and she’d be off finishing this thing or that thing saying “I’m just using my marginal minutes while everyone gets ready.” So, I can’t really blame my kids for wandering off…after all I hate to be idle and waste time too…so I always have a book (or kindle..LOVE the kindle) handy for waiting rooms, or I’m always finding something to do while waiting for something else. I’ll even admit to reading while giving the kids their spelling “tests”…I figured out that it takes them about the same amount of time to write a spelling word as it takes me to read a sentence or two. This makes me super efficient…no? So, I can understand their desire to be reading or drawing or playing something while they are waiting for me…but I still find it so frustrating. After all, one of the hardest part of parenting is realizing that it is our own traits we see in our children that drive us the most crazy. At least for me it is…I’ve come to realize that the child that is most like me…is the one that drives me the craziest. Ha! So..where was I…oh that’s right..this post was about balance. But, I’m having such a hard a time balancing everything that I’ve lost my train of thought and can’t quite remember where I was going with this. Other than to say, that I feel we need more balance in our lives and in our schooling. I always envisioned us doing a lot more “fun” activities while homeschooling..you know…cool stuff like science experiments and art projects. Never mind the fact, that we almost NEVER have those “basic household things” that most science projects call for. Like an experiment will call for rubber bands or something, and I’ll go to get the rubber bands and realize that our rubber bands are older than our oldest child, and they just snap in two. So, there goes that experiment. So, this year, in 2013..my goal is try to find a better balance for our school..find a way to keep all children engaged at once and find a better way to balance our time, so we have more “time” for the extra, fun stuff…like Latin. Ha…bet you never saw the words “Latin” and “Fun” in the same sentence before. And, carry on fellow homeschooling mamas..carry on! The Christmas Season is almost over …but not yet. It’s STILL Christmas until the Epiphany, which means I’m totally, completely justified in writing about a line from a Christmas Carol on January 1st, right? What I want to know is exactly what is heavenly peace? And, how come my baby isn’t sleeping in it? You see, with a young baby, the topic of sleep seems to come up a lot in conversations. And, I’m never quite sure how to answer the question on “how is she sleeping”. I just want to say “like a baby” and leave it like that, because well..she sleeps like a baby….which mean she wakes up a lot and doesn’t like to be put down. The thing is, Elsa spends a good portion of the day, NOT napping..she is basically a terrible, horrible, no good, very bad napper. .I try to put her down…she wakes up. Someone whispers near her…she wakes up. A butterfly flaps its wings in China…she wakes up. The only way she really naps well is if she is in the sling, and I’m basically running walking a marathon. Don’t get me wrong…I love walking with her in the sling..but I generally can’t do that more than twice a day (once in the morning during *my* exercise and once in the evening when I take my kids.) Of course, if I did, I might be a lot skinnier. Alas, I have other duties I must attend to and other children that must do important things…like school..so I end up just holding her for most naps..which isn’t so bad because they only last about 8 1/2 minutes anyway and I can happily sit and surf the ‘net for 8 1/2 minutes. And, that’s okay..because she is only 3 months old and a baby needs her mama..and that’s the way it’s supposed to be. But nighttime on the other hand…nighttime is different. Nighttime sleep is glorious. We sleep cuddled up together and Elsa frequently goes 6 hours or so without waking up. Ten years ago, when Heidi was born, someone gave us a beautiful bassinet. We set it up in the bedroom and that first night home from the hospital, I laid her in it and then went to bed and tried to go to sleep. Thirty seconds later, I popped out of bed and had to peek at her…just to make sure she will still breathing. I lied down again and tried to sleep…only to do another breathing check about a minute later. Then I realized, I’ve never get any sleep that way, took her into bed with me and have been co-sleeping with babies ever since. (my kids typically move into their own bed and room sometime around age 3). There is nothing more delightful than cuddling up in bed with a sweet infant and falling asleep together while they nurse. That is what heavenly sleep must be like…snuggled up safely next to your most, very favorite person in world (and since I have the “nana” I’m obviously the most very favorite person in the world). When I took Elsa to the doctor when she was only a few days old, the pediatrician asked where she slept and if she slept with me and when I answered in the affirmative she was all “oh, well, I did that too, but we don’t recommend it and I have to advise against it, even though I also co-slept with my kids”. At least she was nice about it. 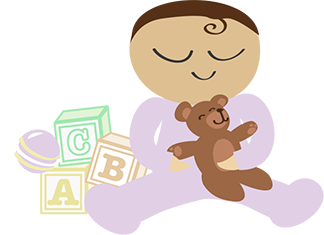 I realize other people manage to get their babies to sleep in a crib and different sleeping arrangements work better for others..but co-sleeping always just felt so natural to me. Or maybe I’m just lazy and will do just about anything not to have to get up out of bed again (okay, no maybe about it..that is a definite). Thankfully however, she does, on occasion, sleep by herself…here is photographic evidence…sometimes she even does this for up to 9.5 minutes at a time..which is what let me write this blog post. But, now she is about to reach the 9.75 minute mark..so I best be off. Merry Christmas! We hope and pray that this 2012 Christmas letter finds you all healthy, wealthy and wise (or at least healthy and wise…if you can’t be wealthy). I decided to use an old, old, old blog of mine to host this letter as that seems the easiest way to share text, photos and videos online without clogging up everyone’s email. And, I am way, way too cheap and lazy, green and Eco-friendly to send out actual postal mail. But, never fear..this letter, blog post contains much more pictures (and even a video) than could be sent through the mail. Furthermore, it has the added bonus that if you find yourself sincerely bored this holiday season and looking for a few laughs, you can look back over my old, old, old rambling posts from 2008 and 2009. I must say that the 35-year old me is totally chuckling at what the 30-year old me wrote. Ah the arrogance of youth! So, without further ado…here is our year in review! In January 2012 the 2nd line turned pink!! We discovered that Bentrup 4.0 was due September 24, 2012. In February 2012, our oldest child entered double digits. Heidi turned 10 on Feb. 13th and we celebrated by taking her and her best friend orange picking. Heidi continues to take piano lessons and is homeschooled in the 5th grade. She likes playing the piano, drawing, reading and playing with her friends. She does not like math. Heidi is a very sweet, loving, caring and helpful girl. We are so blessed to have her. On February 26th, John turned 4 and celebrated by having a train birthday party.. complete with a train (wreck of a) cake. John is homeschooled for pre-K and is beginning to learn letter sounds and beginning spelling. He likes trains, trucks and digging in the dirt. He does not like eating new foods. John is a very smart, creative, and caring boy! He makes our life so much more fun. In May, we found out that unborn baby was another GIRL!! Yay for more X chromosomes!! We’re not quite sure what that bloopy thing she is kissing is…but since she came out healthy and pink…we figured it wasn’t anything worth worrying about. Also, in May…Ben completed his second year of law school and for the first time, made the Dean’s honor roll!! Yay for Ben!!! Also in May…yes…May was a big month…Ben left for Chicago to work during the summer at the Thomas Moore Society, a public interest, pro-life, non-profit law firm in downtown Chicago. He worked on many different, interesting cases which are top secret and confidential, and if we told you about them, we’d have to kill you. On June 9th, Greta made her first Confession and on June 10th (the feast of Corpus Christi), her First Holy Communion. It was a beautiful, holy Mass. Also in June..since Ben was in Chicago..Amelia and kids made like the rich and summered in ritzy Newport,, middle-class Middletown, Rhode Island. In August, we all convened back in Florida. And….on September 11th, at 8:58 PM, Miss Elsa Rose Bentrup decided to make a rather hasty exist from the warm, soft comfortable womb into the cold, cruel world. She was born at home…in our office. I was so blessed to have such a quick and easy birth. The day went something like this…get up, work-out, do school, take girls to piano, go grocery shopping while they are at piano, play outside and talk to neighbor, make and eat dinner, decide that I’m actually in labor, call midwife, have baby…all before bedtime. Just a typical day…no? 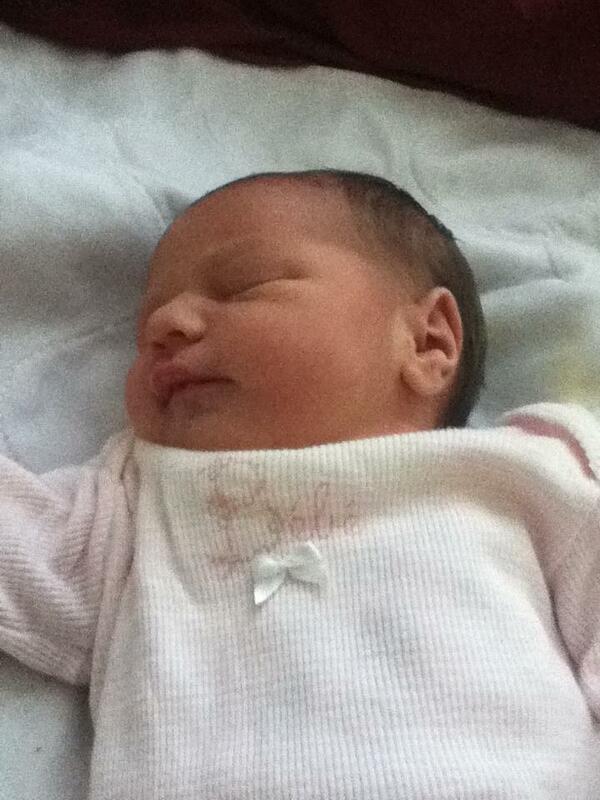 Here she is, about 14 hours after birth. A day later, Grandma hopped on the nearest plane and came down to help out. Look how tired Heidi and Greta look…you’d think THEY were the ones up all night with a newborn. On September 28th, Elsa was Baptized here on campus!!! Elsa has been such a joy and blessing to our family and her older sisters and brother all adore her. As soon as she was born, John got over his disappointment at not getting a little brother and he adores his little sister and says she is “cuter than the cutest baby in the world.” Don’t you all agree?? Here she is at her 3 month birthday. Notice the cute little smile which makes you think she is just thinking of all the mischief she will get into when she is older. Elsa likes nursing, smiling, and “talking.” She does not like napping or sleeping alone. And, here is the obligatory “dress baby up in funny hat and take pictures photo.” We have to have some sort of embarrassing photo to show her future boyfriends, right? And, check out those baby blues! On October 19th, Greta turned 8 years old and celebrated with her friends at a birthday party at the beach! Unfortunately the RED TIDE (which wasn’t actually red) was in that day and the ocean was littered with dead fish floating on top of water. Eeeek! Luckily however, none of her little friends got sick and sued us…so all’s well that ends well. Here is Greta wearing her brand new princess dress, made by Aunt Alison! Thank Aunt Al! Greta also takes piano lessons and is homeschooled in the 2nd grade. She likes playing the piano, drawing, writing stories, reading (especially Little House on the Prairie books) and playing with her friends. She does not like math and being bored. Greta is super creative and imaginative and social and fun. She makes our lives so much happier. Notice how both Heidi and Greta listed “playing with their friends” as amongst their favorite activities. They are a total pair of social butterflies. On October 31st, the kids all had tons of fun at the annual All Saint’s Day Party. They are St. Dymphna, St. Appolonia and St. John of the Cross (and holy baby!). This coming December 30th, Ben and I will celebrate our 12th wedding anniversary! I can’t believe it’s been 12 wonderful years already! I’m wondering if the next 12 years will bring as much adventure as the past 12 years have!! Here’s all 4 of the Bentrup babes! Here is a link to their annual Christmas video where you can hear them singing Christmas carols…a capella even! Sorry, but for some reason I can’t get it to imbed. Last but not least…here is our attempt at a family portrait. I’m sure you all really wanted a picture of John’s eyelids and Elsa’s roly, poly neck, no? Elsa was actually enamored with a squirrel when we took this picture. With lots of love and warm wishes for a Blessed and Holy Christmas and Healthy, Happy 2013! P.S. Ben is on track to graduate from law school this spring. So, if you ever find yourself hauled off in handcuffs…keep his phone number handy! Please pray for him this year, as he job searches and studies for the bar. Next year’s Christmas letter will probably be hailing from a new state. God only knows what other adventures are in store! My Home Remedies My OTHER website….a researched collection of home remedies and natural cures!